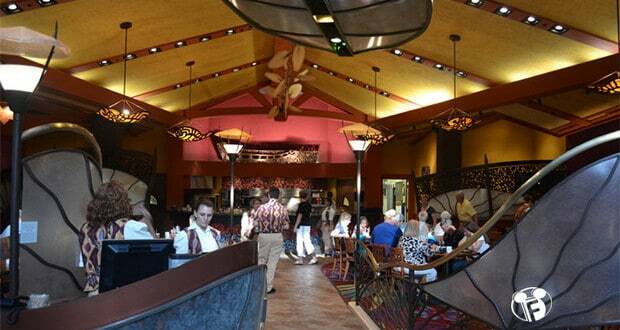 The Kona Café is located inside Disney’s Polynesian resort. This laid back café has a great island feel and an open sushi kitchen! Listed below are 7 things we love about Kona Café. 7. Location: The Kona Café is located upstairs in the Polynesian Village Resort. This casual restaurant overlooks the great ceremonial house and has an open island feel to it. Disney’s Polynesian Village Resort is one of the most beautiful resorts in our opinion. The South Pacific culture, flora and fauna inspire the whole resort. The resort is also a stop on the monorail from the Magic Kingdom. It is a great place to take a break from the parks and have a relaxing meal. 6. Open Sushi Kitchen: One of the highlights of the café is the open sushi kitchen. The whole restaurant has a very open feel to it so you can see the kitchen from all angles. Traditional sushi chefs can be seen here hand rolling sushi, sashimi and more. The sushi kitchen provides over 10 sushi rolls and can even customize rolls for you! 5. Cost and Reservations: Not only does Kona Café provide a great atmosphere, they also provide delicious food for averages prices. Plates here range from $14.99 to $29.99 per adult. Some dining plans are also accepted here. We would definitely you make a reservation here. You can make reservations up to 180 days before you visit. You can read more on how to make Disney Dining reservations here. 4. Kona Coffee and other specialty drinks: Kona, Hawaii is famous for their coffee. Kona Café serves Kona coffee from Hawaii. It is a must try for coffee lovers! For adults there are several specialty drinks available. One of the most impressive is the Lapu Lapu, this tropical drink is served in a fresh pineapple. Also available is a selection of sake, imported Kona beer. 3. 3 menus a day: The Kona Café is open daily for breakfast, lunch and dinner. This means that there are 3 menus of delicious American cuisine with a South Seas twist. For example at breakfast we would recommend the macadamia-pineapple pancakes. There is also a different kid’s menu available at breakfast, lunch and dinner. 2. Atmosphere: The atmosphere of this café is as relaxed as you would feel on a beach in Hawaii. The decorations are beautiful and provide a tropical paradise for you and your family to enjoy. Even though this is a popular spot the sound level is never high and you can always hear the faint sounds of island music. Make sure to look around for some tropical hidden Mickeys! 1. Menu: The menu at Kona Café has so many options! From a variety of appetizers, entrees, sushi, desserts and more this restaurant has everyone covered. The style of food is American with an Asian twist. The food is very family friendly. There are more traditional items available for both adult and kids and also other options with that South Seas touch. I am a middle school science teacher during the school year and an avid SCUBA diver. I have been a Disney Fanatic since I can remember. I got engaged at the Magic Kingdom. Living the south Florida area and being an annual pass holder, I am able to visit the Disney World parks several times a month. I love going with my friends and family and experiencing the magic together.